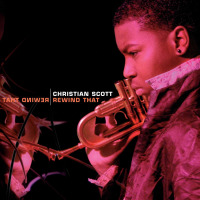 Trumpeter Christian Scott started raising expectations in 2006, with Rewind That (Concord), and hit the spot again in 2007 and 2008. Those earlier promises of greatness are clinched by Yesterday You Said Tomorrow. 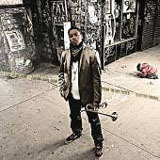 Scott's fourth Concord album is a gym-ripped amalgam of edgy jazz, hip hop and rock rhythms, off-kilter ostinatos, intimate rhapsodies and full-on passions, all welded together by the New Orleans-born player's alternately caressing and searing horn, and by his most tightly focused band to date. 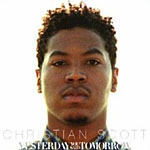 Scott's very modern approach to jazz gains added weight from the album's close embrace of the stylists of the mid- to late-1960s. References to trumpeter Miles Davis' second quintet, saxophonist John Coltrane's classic quartet and bassist Charles Mingus' contemporaneous bands abound. As though to emphasise the provenance, the album was co-produced by the veteran Blue Note engineer, Rudy Van Gelder, in whose studio it was recorded. Other 1960s resonances can be heard: the electric acid blues of Jimi Hendrix (guitarist Matthew Stevens is also adept in fluid, Pat Metheny-like lyricism), and, though Yesterday You Said Tomorrow is an instrumental album, the protest movement led by singers such as Bob Dylan and Curtis Mayfield. "I wanted to create a musical backdrop," says Scott in the publicity material accompanying review copies, "that referenced everything I liked about the music of the 1960s." Fast forward 40 years, and it's what Scott has done with the backdrop that matters. The track titles give a clue. "K.K.P.D.," the ramped-up tune which kick starts the album, has a title which stands for Klu Klux Police Department, and refers to what Scott calls the "phenomenally dark and evil" attitude of the local police toward the African-American citizens of New Orleans. "Angola, LA & The 13th Amendment," its episodic ebb and flow steered by Scott's by turns melancholy and incandescent trumpet, equates aspects of the prison system with slavery. 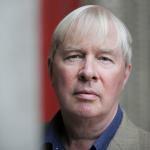 "The American't" targets the same depressingly enduring racism referenced by "James Crow, Jr. Esq." 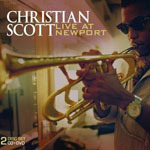 on Live At Newport (Concord, 2008). "Jenacide" needs no explanation. The mood endures, other than on the emollient "The Eraser" (written by Radiohead's Thom Yorke and the only non-original on the album), and two gorgeous ballads, "Isadora," from Live At Newport, and "The Last Broken Heart." Still only 26, Scott has decades of further development to look forward to. Meanwhile, this is his first landmark album, and one to make you feel good about the future of jazz. Track Listing: K.K.P.D. ; The Eraser; After All; Isador; Angola, L.A. & The 13th Amendment; The Last Broken Heart; Jenacide; The American't; An Unending Repentance; The Roe Effect. 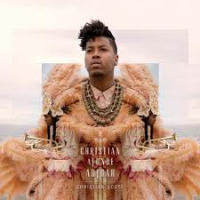 Personnel: Christian Scott: trumpet; Matthew Stevens: guitar; Milton Fletcher Jr.; piano; Kristopher Keith Funn: bass; Jamire Williams: drums.